The Social Register is a semi-annual publication in the United States that indexes the members of American high society. First published in the 1880s by newspaper columnist Louis Keller, it was later acquired by Malcolm Forbes. Since 2014, it has been owned by Christopher Wolf. Long a directory of well-connected, patrician families from the northeast United States, it has, in recent years, diversified both in the geography and ethnicity of those it lists. At the same time, however, its importance as an arbiter of class has waned. The Social Register was born out of the Gilded Age. Pictured is the Gilded Age mansion, Biltmore, in Asheville, North Carolina. In antebellum New York City, the social elite was still a small enough group that no formal method of tracking individuals was necessary. With the advent of the Gilded Age, however, fashionable ladies began the practice of leaving calling cards at the homes of other notable women whom they visited; these cards would be cataloged into "visiting lists". In 1887, Louis Keller, a newspaper society columnist and golf promoter, compiled the names of those on the visiting lists of the most prominent New York women into a published volume titled the Social Register. [a] Inclusion in the registry was done under the supervision of an anonymous advisory committee composed of some of those listed. This first edition of the Social Register listed more than 5,000 people, most of whom were descended from early American settler families. Joseph Pulitzer was the only Jew to be listed, and people from new money were generally not included. The register, it has been noted, was very much a product of Gilded Age excess. By World War I, the Social Register had expanded into a multi-volume annual which included listings of Society members in 26 U.S. cities. 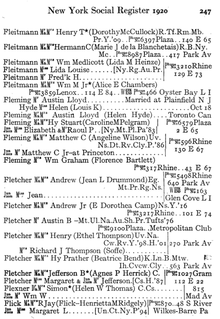 Following Keller's death in 1924, the Social Register passed to several of his heirs. A 1973 column in The New York Times about that year's Social Register observed that – unlike males listed – the volume did not list the universities attended by females, unless they were students: "The fact that Mazie Cox is a 1967 graduate of Smith is not mentioned, although pains are taken to indicate that she is a member of the Colony Club, the Daughters of the Cincinnati and the Colonial Dames of America." It also noted that married women who chose to retain their maiden names would be listed under the surname of their husband regardless. In 1976, ownership of the Social Register was acquired by Malcolm Forbes and, the following year, he re-consolidated the various city books back into a single volume for the whole of the United States. A study of the 1988 Social Register found that approximately 10 percent of those listed resided in Manhattan with the Upper East Side zip code of 10021 hosting the greatest concentration of listed persons. The Forbes family retained ownership of the Social Register until 2014, when it was sold to Christopher Wolf, a "longtime, listed member". Inclusion in the Social Register has historically been limited to members of polite society, members of the American upper class and The Establishment, and/or those of "old money" or White Anglo-Saxon Protestant (WASP) families, within the Social Register cities. According to McNamee and Miller: "the acronym WASP... is exemplified by the Social Register, a list of prominent upper-class families first compiled in 1887... There is great continuity across generations among the names included in these volumes." The cities are Newport, Rhode Island, Baltimore, Boston, Chicago, Cleveland, New York, New Jersey, Philadelphia, Pittsburgh, Portland, Providence, San Francisco, Seattle, St. Louis, and Washington, D.C., as well as ones for "Southern Cities". In European countries, similar directories for the perceived upper class, such as Burke's Peerage and Landed Gentry in the United Kingdom, have been published for centuries. According to the Robb Report, inclusion in the Social Register "bespeaks old money, Ivy League, trust funds, privileges of birth, fox hunting, debutante balls, yachting, polo, distinguished forebears, family compounds in the Adirondacks, and a pedigree studded with 19th-century robber barons". However, while inclusion in the Social Register was once so important for members of Society that, according to Brooke Astor, "if someone wasn't listed, you just didn't know them", by the late 1990s its influence had seriously waned. In 2002, novelist Tom Wolfe said that he no longer heard regular reference to the Social Register and opined that the "world of social luster has been so overshadowed by celebrities that it doesn’t have any kick anymore". An individual's listing in the Social Register has generally included contact information, schools attended, and the social and country clubs to which they belong. Because many of the institutions cited are done so repeatedly, an extensive system of abbreviations is used; for instance "P" stands for Princeton University while "BtP" represents the Bath and Tennis Club of Palm Beach, Florida. Wealth or fame has, traditionally, been insufficient for inclusion in the Social Register; Kim Kardashian and Gloria Vanderbilt were never listed and Donald Trump, prior to his election as President of the United States, was also not included. A 1985 article reported that "enrollees need plenty of green (money), blue (blood), and lily white". Listing in the Social Register has typically been through birth; children born to a person listed in the Social Register are themselves added. Persons have also been permitted to apply for inclusion in the Social Register. Such applications require letters of sponsorship from five persons already listed, followed by vetting from the advisory committee. A spokesman for the Social Register's then 25-member advisory committee, in 1997, described the criteria by which a person might be added to the directory. The committee, he said, asked themselves "would one want to have dinner with this person on a regular basis"? The President of the United States and Vice-President of the United States are, by custom, always added. Reasons for removal from the Social Register have traditionally been opaque. In the early 20th century, historian Dixon Wecter observed that those excluded tended to be persons unfavorably reported upon in the press and that, as long as one's private life "keeps out of the [newspaper's] columns" the risk of exclusion was low. A Social Register spokesman reported, in 1985, that elderly persons who failed to remit the questionnaire sent to listed persons by the register for eleven consecutive years were removed. In addition, someone who married a person who was not, themselves, listed in the Social Register might have been dropped. As of 1988, about 35,000 individuals were included in the Social Register. By 2014, this number was reported to be approximately 25,000. The 1934 film Social Register presented a fictitious look at the lives of persons on the Social Register. ^ A Social Register, published by Keller for Newport, Rhode Island, preceded the New York edition by one year. ^ a b Montgomery, Maureen E. (2016). Displaying Women: Spectacles of Leisure in Edith Wharton's New York. Routledge. p. 238. ISBN 1134952864. ^ a b c d e f Smith, Jack (January 8, 2018). "The Membership You Weren't Allowed to Talk About Is Now Open to New Recruits". Robb Report. Retrieved May 6, 2018. ^ a b c d e f g Winship, Frederick (February 11, 1988). "Social Register Marks 100 Years of Listing Everybody Who's Anybody". Los Angeles Times. Retrieved May 6, 2018. ^ a b c Higley, Stephen (1995). Privilege, Power, and Place: The Geography of the American Upper Class. Rowman & Littlefield. pp. 29–30. ISBN 0847680215. ^ a b Robinson, Ruth (December 5, 1973). "'74 Social Register Has Few Surprises". New York Times. Retrieved May 6, 2018. ^ Morin, Richard (August 6, 1995). "America's Social Elite Still Love New York". Spokesman Review. Universal Press Syndicate. Retrieved May 6, 2018. ^ a b Kelly, Keith (November 1, 2014). "Forbes sells directory that catalogs Old Money families". New York Post. Retrieved May 6, 2018. ^ Stephen J. McNamee; Robert K. Miller (2004). The Meritocracy Myth. Rowman & Littlefield. p. 63. ISBN 9780742510562. ^ The Philadelphia volume included Wilmington, Delaware. ^ a b c d e Allison, Sargent (December 21, 1997). "The Social Register: Just a Circle of Friends". New York Times. Retrieved May 6, 2018. ^ DiGiacomo, Frank (June 17, 2002). "The Forbes Family is Scaling Back Social Register". New York Observer. Retrieved May 6, 2018. ^ a b Smith, Martha (February 8, 1985). "Cleaning House At Social Register -- High Society Can`t Pass (blood)". Chicago Tribune. Scripps-Howard News Service. Retrieved May 6, 2018. ^ Widdicombe, Lizzie (March 26, 2012). "Original". New Yorker. Retrieved May 6, 2018. ^ Mills, C. Wright (1956). The Power Elite. Oxford University Press. pp. 55–57, 72, 74, 80. ^ C. Wright Mills (2000). The Power Elite. p. 56. This page was last edited on 20 March 2019, at 07:55 (UTC).